*Terah (Thara/Azer/Zarah/Athar) is considered to be the 20th Generation descendant from Adam and Eve in the Seth line of succession. Tohwait is thus assumed to also be a 20th Generation descendant from Enki and Eve [26th from Tiamat], but via the Cain line of succession. [See the Royal Line of Seth for a continuation of Terah’s line.] Terah is clearly a contemporary of Amenemhet I... inasmuch as both were married to Tohwait... but ostensibly, not at the same time. NOTE: Mahalath of Egypt married Ishmael, first son of Abraham (by Hagar of Egypt) -- a marriage again connecting the Cain and Seth lines. Ishmael and Mahalath had 2 children, Nebajoth (Namemoth) and Bashemath, the latter who married Esau of Edom (Isaac’s first son, usurped in his birth right by Jacob). Esau also married Adah (daughter of Elon the Hittite). Esau took as his third wife, Mahalath (Ishmael’s widow) [shown in Figure 1 as Mahalath II]. Esau and Mahalath II had a daughter, Igrath (who was Amenemhet III’s second wife). 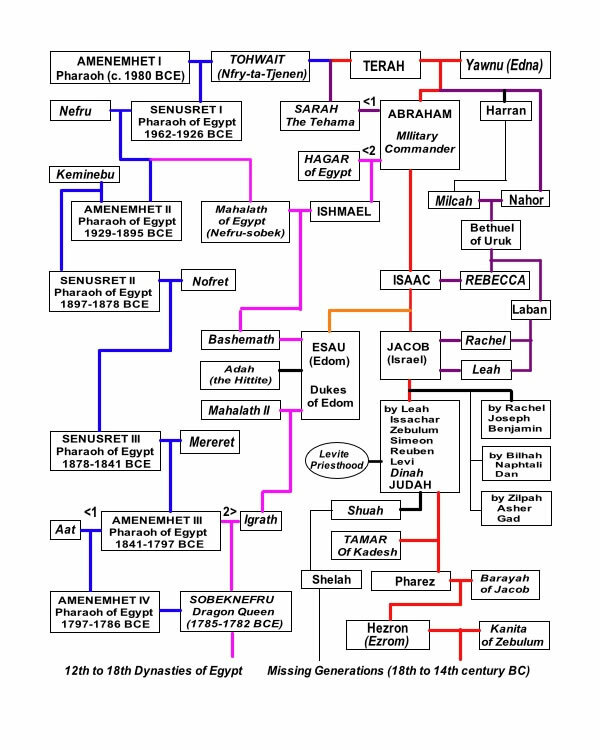 All of these intermarriages brought the Cain (/Egyptian) and Seth lines into a complex family tree... to say the least. The key is that there were a lot of intermarriages going on... and indirectly conferring a greater degree of royalty on the Seth line during the time of Abraham. (Recall that Abraham (Abram) had been born in Ur - Mesopotamia, i.e., Ur of the Chaldees). Senusret I was the second pharaoh of the Twelfth Dynasty of Egypt. He ruled from 1971 (or 1962) BC to 1926 BC, and was one of the most powerful kings of his Dynasty. He was the son of Amenemhet I and his wife Nefertitanen. His own wife and sister was Neferu. Neferu was also the mother of the successor Amenemhet II. Senusret I was known by his prenomen, Kheperkare, which means "the Ka of Re is created." Senusret I continued his father's aggressive expansionist policies against Nubia by initiating two expeditions in his 10th and 18th Years and established Egypt's formal southern border at the fortress of Buhen near the second cataract where he placed a garrison and a victory stele. He also organized an expedition to a Western Desert oasis in the Libyan desert, as well as establishing diplomatic relations with several rulers of towns in Syria and Canaan. He tried to centralize the country's political structure by supporting nomarchs who were loyal to him. His pyramid was constructed at el-Lisht. Senusret I is mentioned in the Story of Sinuhe where he is reported to have rushed back to the royal palace in Memphis from a military campaign in Asia after hearing about the assassination of his father, Amenemhet I.
Senusret was crowned co-regent with his father, Amenemhet I, in his father's 20th regnal year. Towards the end of his own life, he appointed his son Amenemhet II as his co-regent. The stele of Wepwawet? is dated to the 44th year of Senusret and to the 2nd year of Amenemhet, thus he would have appointed him some time in his 43rd year. Senusret is thought to have died during his 46th year on the throne since the Turin Canon ascribes him a reign of 45 Years. Amenemhet II established a co-regency with his son Senusret II in his 33rd Regnal Year in order to secure the continuity of the royal succession. His pyramid was constructed at Dahshur and is only little researched. [Dahshur, BTW, is actually incredibly important as an archaeological site, and includes some phenomenal, undamaged friezes in a narrow basement chamber.] Next to the pyramid were found the tombs of several royal women; in some cases they were found undisturbed and still contained golden jewelry. Senusret II and Ameny were the viziers at the beginning of the reign. The overseer of the gateway Khentykhetywer is attested on a stelae, where he reports on an expedition to Punt. This latter bit may be particularly important in that it extends “Punt’s” time in the sun from the time of Queen Hatshepsut (c. 1475 BC) and extends it back to roughly 1900 BCE. In the Seth line, 1900 BCE corresponds to roughly the time of Isaac’s birth. This would imply that Abraham had left Mesopotamia in his 75th year... while Isaac showed up in Abraham’s 100th year. Thus “Punt” could easily have been established in what came to be Israel/Judah. Note also that when Abraham visited Egypt, he went directly before the Pharaoh... not bad for someone traditionally depicted as a wandering sheepherder. More on that a bit later in The Royal Line of Seth. Meanwhile, Punt is already on the ancient map, a fact that may well disallow several theories on precisely where Hatshepsut made her famous journey. Amenemhet II and his son, Senusret II, shared a brief co-regency, which was the last certain one of the Middle Kingdom. The stela of Hapu at Aswan dates to the third year of Senusret II and to the 35th year of Amenemhet, meaning that Senusret was crowned in his father's 33rd regnal year. The name of the younger king is placed ahead of the senior king, which may possibly indicate Senusret was the dominant personality in the co-regency even before his father died, although such speculation is based on far too little evidence for a fair evaluation one way or the other. Khakeperre Senusret II was the fourth pharaoh of the Twelfth Dynasty of Egypt. He ruled from 1897 BC to 1878 BC. His pyramid was constructed at El-Lahun. Senusret II took a great deal of interest in the Faiyum oasis region [where the Labyrinth of Egypt is located] and began work on an extensive irrigation system from the Bahr Yusuf through to Lake Moeris by means of the construction of a dike at El-Lahun and the addition of a network of drainage canals. The purpose of his project was to increase the amount of cultivable land here. The importance of this project is emphasized by Senusret II's decision to move the royal necropolis from Dahshur to El-Lahun where he built his pyramid. This location would remain the political capital of the 12th and 13th Dynasties of Egypt. The king also established the first known worker's quarter in the nearby town of Senusrethotep (Kahun). Unlike his successor, Senusret II maintained good relations with the various local and influential nomarchs or provincial governors of Egypt who were almost as wealthy as the pharaoh himself. On the other hand, Senusret II may not have shared a co-regency with his son, Senusret III, unlike most other Middle Kingdom rulers. In 1889 CE, the English Egyptologist Flinders Petrie found "a marvelous gold and inlaid royal uraeus" that must have originally formed part of Senusret II's looted burial equipment in a flooded chamber of the king's pyramid tomb. The tomb of Princess Sit-Hathor-Iunet, a daughter of Senusret II, was also discovered by Egyptologists in a separate burial. Petrie also found and remarked on the Labyrinth of Egypt... albeit not always accurately. Khakhaure Senusret III (also written as Senwosret III or Sesostris III) was a pharaoh of Egypt. He ruled from 1878 BC to 1839 BC, and was the fifth monarch of the Twelfth Dynasty of the Middle Kingdom. He was a great pharaoh of the Twelfth Dynasty and is considered to be perhaps the most powerful Egyptian ruler of this time. Consequently, he is regarded as one of the sources for the legend about Sesostris. His final campaign in Year 19 was less successful because the king's forces were trapped by a low Nile current and had to retreat and abandon their campaign to avoid being trapped in hostile Nubian territory. Such was his forceful nature and immense influence that Senusret III was worshipped as a god in Semna by later generations. His pyramid was constructed at Dahshur. He may have initiated a co-regency with his son in the 20th year of his reign. Amenemhet III (Amenemhet III), was a pharaoh of the Twelfth Dynasty of Egypt. He ruled from c..1860 BC to c..1814 BC. He is regarded as the greatest monarch of the Middle Kingdom. He may have had a long co-regency (of 20 years) with his father, Senusret III. Towards the end of his own reign he instituted a co-regency with his successor Amenemhet IV. His daughter, Sobeknefru, later succeeded Amenemhet IV, as the last ruler of the 12th Dynasty. Amenemhet III's throne name, Nimaatre, means "Belonging to the Justice of Re." He built a first pyramid at Dahshur (the so-called "Black Pyramid") but there were building problems and this was abandoned. Around Year 15 of his reign the king decided to build a new pyramid at Hawara [near the Faiyum Oasis, Lake Moeris and immediately adjacent to the site of the Labyrinth of Egypt]. His [so-called] mortuary temple at Hawara, is accompanied by a pyramid and was known to Herodotus and Diodorus Siculus as the "Labyrinth." Strabo praised it as a wonder of the world. The king's pyramid at Hawara contained some of the most complex security features of any found in Egypt and is perhaps the only one to come close to the sort of tricks Hollywood associates with such structures. Nevertheless, the king's burial was robbed in antiquity. His daughter, Neferuptah, was buried in a separate pyramid (discovered in 1956) two kilometers southwest of the king's. The Rhind Mathematical Papyrus is thought to have been originally composed during Amenemhet's time. NOTE: While Amenemhet III’s pyramid and burial chamber might have been looted in antiquity... there is every reason to believe that the Labyrinth was not so looted. The possibilities of what might be found there are quite literally astounding and incredible. More on this in the web page, The Labyrinth of Egypt -- notably worth reading. Amenemhet IV (Sobehneferu, Amenemhet IV) was Pharaoh of Egypt, likely ruling between 1815 BC and 1806 BC. He served first as the junior co-regent of Amenemhet III and completed the latter's temple at Medinet Maadi, which is "the only intact temple still existing from the Middle Kingdom". The temple's foundations, administrative buildings, granaries and residences were recently uncovered by an Egyptian archaeological expedition in early 2006. Amenemhet IV likely also built a temple in the northeastern Fayum at Qasr el-Sagha. He served the first year of his reign as the junior co-regent to his powerful predecessor, Amenemhet III. His short reign was relatively peaceful and uneventful; several dated expeditions were recorded at the Serabit el-Khadim mines in the Sinai. It was after his death that the gradual decline of the Middle Kingdom is thought to have begun. Amenemhet died without a male heir, and was succeeded by his wife, half-sister (or perhaps his aunt) Sobeknefru, who became the first woman in about 1500 years to rule Egypt. Sobeknefru’s name meant “Beautiful of the god Sobek”. Sobek was the mighty crocodile -- the very spirit of the Messeh, whose great temple was erected at Kiman Faris by her father. “As the thirteenth pharaonic dynasty drew to a close, other parallel dynasties began to rule alongside the main kingly succession. These coextensive kings ruled in the eastern delta, beginning with the short-lived fourteenth dynasty, followed by the simultaneous fifteenth and sixteenth dynasties called the Hyksos delta kings. They governed from about 1663 BC alongside the seventeenth Theban dynasty of the main succession, until finally deposed by the eighteenth-dynasty founder, Pharaoh Ahmose I, in about 1550 BC. "The Hyksos were also considered brothers of the Mesopotamian regions such as Mari, Babylon, and Larsa. The Hyksos kings were in fact “Amorite descendants of Ham and as such would have been of a strain related to the early second dynasty -- perhaps even to the twelfth dynasty of Queen Sobeknefru. One way or another, they challenged the seventeenth dynasty of Thebes, and in matters of warfare they introduced the horse, the chariot and the compound bow, none of which had formerly been used in Egypt. These things were, however, previously apparent in Troy, from where the Sea Kings (those of As-Mu) and their followers spread into the Mediterranean seaboard lands after Troy V was devastated by fall-out from the Mount Santorini eruption in 1624 BC. It is likely, therefore, that the Hyksos (who where called the ‘Foreign Rulers’) were of Trojan origin. “Although reference books make much of the fact that Ahmose I succeeded in overthrowing the Hyksos rulers, it is evident that there were marital alliances between the competing houses of Avaris and Thebes. It is generally reckoned that the Kyksos Pharaoh Apepi II (Apophis) was the last hereditary Dragon King in Egypt, but it would appear that the heritage was perpetuated through the female line into the new dynasty. Even the grave of Ahmose’s son Amenhotep I [second pharaoh in 18th dynasty] contained a preserved vase cartouche of the daughter of Apophis, which signifies the enmity was not so great between the houses as is traditionally supposed. The 13th through the 17th Dynasties of ancient Egypt -- which also constitute what is known as the “Second Intermediate Period” -- included 11 pharaohs in the 13th, 1 in the 14th, and 5 in the 17th. Concurrent with the Egyptian 17th dynasty were the 15th and 16th dynasties (the 15th and 16th ruling simultaneously). These were the Hyksos Delta Kings, who were descended from Walid, Prince of the Hikau-khoswet (and quite possibly Troy). The last of the Hyksos Delta Kings was deposed by Ahmose I (c. 1562 BC), who founded the 18th Dynasty. However, many of the so-called generations of the 13th through 17th dynasties were not generations per se, and instead were sometimes relatively brief periods of reigns. Furthermore, more than one member of a generation might have ruled consecutively (e.g. Queen Hatshepsut and her husband Tuthmosis II; Aye as probably a usurper of Tutankhaten’s reign... and so forth and so on). There was also a lot of abruptly shortened reigns in Egypt. Real power tends to attract vultures of all kinds. The genealogical problem in the bloodline descent is that the confusion generated by simultaneous and split Egyptian rule, combined with invasions by non-Egyptians (but who may nevertheless have still carried the royal blood of Ham and Cain). Accordingly, rather than add confusion and bewilderment to a plague of unwarranted genealogical assumptions, we will muddle along with the Muddled Generations (33-41). The actual number of said muddled generations used in this genealogy is derived both from the dating of the end of the 12th Dynasty (1782 BCE) and the beginning of the 18th Dynasty (c. 1562 BCE), and from the Bible’s Missing Generations... which traditionally covers 400 years. Based upon the generational “turn-over” during Egypt’s Dynasties, we will assume an average transition period of X years per generation (and then apply this same timing to the “muddled generations” for the 13th through 17th Dynasties. The 18th Dynasty from Ahmose I (beginning 1562 BCE) to Thutmose IV (beginning 1412 BCE) includes six typical reigns (excluding Hatshetsup) over a period of 150 years, or 25 years per reign. Accordingly, if there are ~220 years in the Egyptian 13th-17th dynasties, then this would imply 8.8... or 9 generations. As will soon be seen, the descendants of Seth have also had some gaps... what will be referred to as their “missing generations”. While it is true that some sources suggest a tradition of assigning 40 years per generation for the Jewish descent... it seems unlikely that as slaves or royalty, that they were going to have longer reigns than Egyptian royalty. Accordingly, we will utilize the extremely important marriage between Kiya-tasherit (of the 18th Dynasty) and Ram (aka Rama), the latter being from Seth’s line of descent... and following a very long dearth of record keeping (or preserving). We will also, somewhat arbitrarily, assume that the marriage made Kiya and Ram contemporaries... occasionally a good idea for happy marriages. Thus if Kiya is assigned Generation No. 51, then Ram is also No. 51... if only to simplify the bookkeeping. The Descent from Seth to Hezron will be our next stop along the Mother of All Family Trees, prior to our returning to the Generations of Ahmose... for an excursion up the 18th Dynasty of Egypt's Nile.